On April 11, 2019 from 6:30-7:30pm Alicia Svigals will lead our Instrumental Klezmer Workshop! 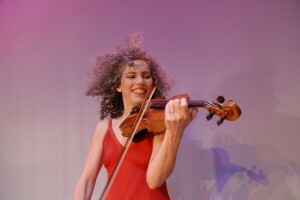 Alicia Svigals, violinist/composer and a founder of the Grammy-winning Klezmatics, is the world’s foremost klezmer fiddler. Alicia almost singlehandedly revived the tradition of klezmer fiddling, which had been on the brink of extinction until she recorded her debut album Fidl in the 1990’s. In February 2018, Svigals and jazz pianist Uli Geissendoerfer released her newest album, Beregovski Suite, a fantasy on klezmer melodies culled from the archive of early 20th century Soviet Jewish ethnomusicologist Moshe Beregovski.Svigals is also a composer who works in many genres. She was an NEA MacDowell Fellow in 2014, an honor for first-time fellows of “extraordinary talent.” She is the recipient of the Foundation for Jewish Culture’s 2013 New Jewish Culture Network commission for her new live score to the 1918 Pola Negri silent film The Yellow Ticket, which she tours internationally with pianist Marilyn Lerner, and was commissioned to create an expanded version of the score for the Seattle Symphony’s clarinetist Laura DeLuca, premiering in May 2014. She was fellow at LABA: a Laboratory of New Jewish Culture in 2014, where she studied Jewish texts with a multidisciplinary group of fellows and wrote a song cycle for soprano, violin and accordion drawn from that experience. In June 2018, Flicker Alley released her score to the 1923 silent film Das Alte Gesetz, co-written with pianist Donald Sosin, which they are touring internationally. In 2011 we added a Klezmer Workshop to the series. Usually led by the concert artist, but sometimes led by series director, Aaron Alexander, the focus is on learning classic klezmer repertoire – usually we’ll learn a few tunes each week. We learn Klezmer and co-territorial tunes, forms and their proper rhythms, the common klezmer modes, melodic ornamentation, accompaniment parts, and whatever people want to learn. Often we will play songs we’ve learned in the workshop at the jam session after the concert. In the past we’ve had Pete Sokolow, Frank London, Michael Winograd, Alicia Svigals, Jordan Hirsch, Margot Leverett, Zevy Zions, Matt Darriau, Pete Rushefsky, Zisl Slepovitch, Ilya Shneyveys, Sasha Lurje, Vanya Zhuk, and many others lead the workshop. Bring your own instruments. We learn both by ear and with written music. Music will usually, but not always, be available for C, Bb, and Eb instruments. “I got to see great musicians like Elaine Hoffman Watts, Alicia Svigals, and Jeff Warschauer/Deborah Strauss, and I got to sit in and jam with Margot Leverett and Arkady Goldenshteyn.” –Steve Wishnia, bassist.